One of the more heartening stories to come roaring down the information highway of late, at least about food, involves an unbeatable combination: dark chocolate desserts and red wines. Simply put, dark chocolate cake ingredients matched with a suitable selection of red wine not only tastes great, but is very good for you. Almost anybody knows that red wine and chocolate taste terrific — whether consumed separately or together. But there’s also a natural and scientifically verified connection between the two, which the palate and body naturally understand. Organic plant-based compounds called flavonoids create a cohesive, yet unspoken bond between what appeals to our taste buds, and subsequently our digestive system and human physiology in general. Research has strongly suggested that the flavonol compound, or flavones, as well as anthocyanins, has antioxidant, anti-inflammatory, antifungal, and antiviral properties. In other words, flavonoids may help the body suppress various diseases, including heart diseases and cancer. They are naturally found in organics such as herbs, fruits, vegetables, berries, and grapes. Whether eaten together or separately, these food sources have a happy effect on the body. The fact that a variety of dark chocolates are a source of health dispels most of the guilt in today’s health-driven society. People can be at peace eating such delights as dark chocolate cake. Flavonoids play a major role in this happy news. But there’s more to the story. There are other positive ingredients to set alongside flavonoids. Dark chocolate cake can now include higher-quality ingredients that add significant nutritional value, more full-bodied taste, and creamy, melt-in-your-mouth consistencies. When you add unusual ingredients such as fresh zucchini, coffee, white beans, cinnamon, freshly ground flax, or chia seeds, you can turn an old-fashioned chocolate cake into a powerhouse of delectable noshing. Incorporating healthier ingredients such as herbs, spices, seeds, legumes, and fresh, organic fruits and vegetables not only dignifies the foundation of dark chocolate cake desserts; it also enhances compatibility with red wine. 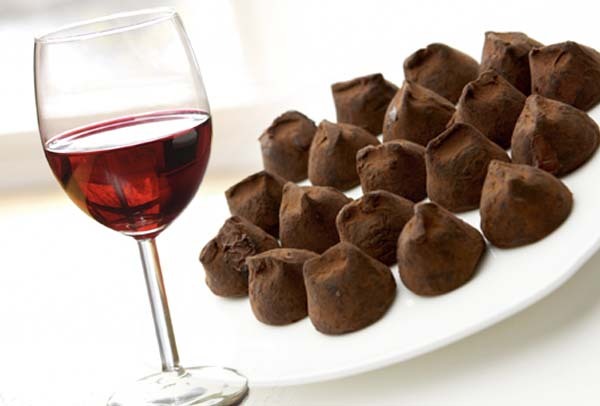 You can achieve a sophisticated effect by pairing a rich, red wine with a robust dark chocolate. Creating a memorable marriage between these two more than palatable delights can be as easy as introducing sweeter dark chocolates to heartier red wines such as a Red Zinfandel or Cabernet Sauvignon. Smooth Merlots or Pinot Noirs delicately balance the sweetness of the chocolate to render a calm, yet embraceable flavor duet. Able-bodied port wines are also a good option with red wines. For dark chocolates that have more of a bittersweet accent, head for the fruitier red wines. Lower sugar content in bittersweet chocolate allows extra room for sweeter flavors such as those found in a Shiraz or Cabernet Sauvignon. Until recently, conversations about these two highly beloved comestibles rarely touched on anything beyond their complementary taste. But now, valuable health lessons play a role in the design of elegant tables set with dark chocolate and red wines. The delicious union of unexpected ingredients in tandem with the sciences of taste, nutrition, and a lot more of Mother Nature’s bounty will make dining an even happier experience for us all.